This is an entry that's a little bit different from my other entries, but I'd like to share a food-related story from my other blog, When Pigs Fly, which is about philanthropy and the wonder of every day blessings. A single grain of rice can tip the scale. How true this is. A single grain of rice can mean the difference between life and death, an act of kindness between hope and despair, a donation the difference between the success or failure of many. Gabriel Bol Deng was here at school today to talk to the kids about his heartbreaking experience as one of the Lost Boys of Sudan and to talk about his organization, Hope for Ariang. Although many would have succumbed to the horrors of what happened in war-torn Sudan, Gabriel is a shining example of someone who took the coal of darkness and hopelessness and reshaped it into a shining diamond of compassion and assistance. He works tirelessly to tell many his story, so they will be inspired to make a difference. Hope for Ariang raises funds to support the construction of a school in Gabriel's hometown that will serve over 600 children and more and the drilling of wells to provide water for over 20,000 people. In preparation for his visit, the 6th grade spearheaded a bake sale to raise money for Hope for Ariang. Last night, we got home late, and since I was not feeling well, I told Christina, "I'm sorry, honey, but I'm just not up to baking something for the bake sale." No matter. Christina said, "I'm fine on my own. 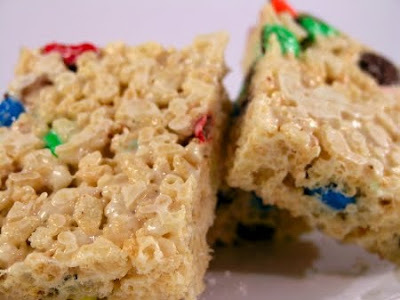 I'm going to make Rice Crispy Treats with M&Ms. I don't really have a recipe, so I'm just going to wing it." As I watched her guesstimate the marshmallows, butter, and some caramel chews, and pour the tumbling grains of crisped rice out of the cereal box, I felt immense pride. Here is a girl who is showing enterpreneurship, resourcefulness, and creativity for a good cause. The next day, we were running late and were in the car already backing out of the driveway when Christina said she needed to get something in the house. She got out of the car, ran in the house, and when she came out, she had some tightly folded dollar bills in her hand. I asked her what they were for, and she said they were for the bake sale. "I have $6 from my piggy bank, and if there's nothing I want to buy from the bake sale, I'm going to give this money anyway. I know this is not about cookies, but about helping kids go to school in Africa." In addition to my earlier pride, I felt immense satisfaction in knowing my daughter understands philanthropy, which means "love of mankind," and what it means to live the school motto, Enter to Learn, Go Forth to Serve. And who knows? Her final six dollars may help pay for the door that will open into a new school and a future for hundreds of children. Note 1: If you want to make a difference, please donate to Hope for Ariang and click here. A little goes a long way. Note 2: Picture is attributed to the Accidental Hedonist. For the link, you can click on the picture or here. Recipe also included in the link. Your daughter sounds like a lovely girl =D. Its always the little things that count, because eventually they add up to big ideas and changes! You must be so proud of that daughter of yours..
Christina is on her way to becoming a lovely, big-hearted person like her mom.